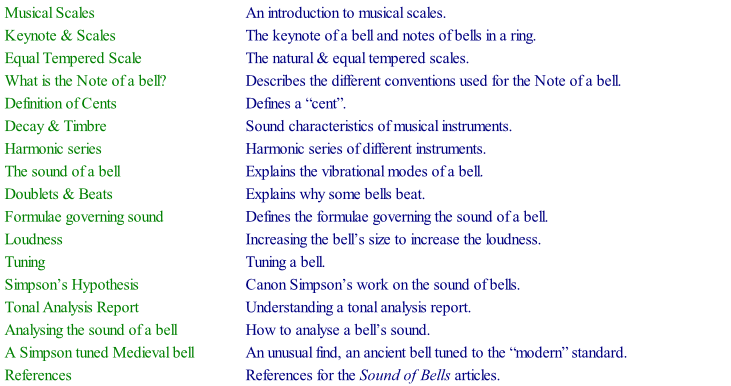 The Sound of Bells articles are based on a series written by David Kelly for publication in The Ringing World. The series has been altered by adding sound and colour as well as additional material. The author would like to thank all those who have helped with the production of the articles, especially David Strong and Bill Hibbert whose expert help and assistance have proved invaluable. For the purposes of the articles the term “bell” refers to a typical church bell and not to a handbell as the difference in profiles, in particular the thicker soundbow of a church bell, creates different harmonic spectra.